As I do every year, I spent Christmas 2014 with my family, surrounded by far too much rich food and wine and generally loafing around for too long. So, by the time the new work year swang around, I was really craving something fresh, tasty and simple to cook to start my recipe diary. This recipe is really quick, very simple, delicious and looks fairly impressive, as well as filling you up with lots of wholesome, fresh ingredients. You should know, as an aside, that I have as many recipe books as I can possibly fit into my one-bed flat, but I hardly ever use them. Even when I do read them, I generally just flick through them for inspiration. When there’s something I like the look of, I Google, read other books and watch videos on YouTube to get the general gist of something before making up my own version, as there are generally ingredients I want to miss out (lemongrass, fresh coriander etc.) as well as extras I think will add another dimension to the dish. True to this ‘philosophy’ as it were, feel free to add or take away anything you like or dislike – I’d love to hear what makes your version yours! 1. Take your steak out of the fridge half an hour or so before you plan to start cooking, although this step is less essential when the temperature in the kitchen is hardly any higher than the temperature in the fridge! Slice into strips and toss in a bowl with around a tablespoon of cornflour and 1 teaspoon of soy sauce. You may prefer more or less of either, but the idea is to give the steak a good coating and then leave to sit for 10 minutes or so. 2. At this point, if I’m using regular broccoli, I stick it in some hot water for a few minutes to start cooking it through. This is an optional step depending on the tenderness of your broccoli and how crunchy you like it. 3. Put some oil in a large pan or wok and turn up the heat! When the oil has reached a fierce temperature, throw in the beef strips in small batches – you’re looking to sear these to seal in the beefy juices and get some good colour on the outside, because it’ll look nice and taste better, without cooking the beef through. If you chuck it all in at once, there’s likely to be too much water in your pan, meaning the beef will boil rather than sear. Remove from the wok as soon as it has good colour on both sides and place somewhere relatively cool to stop the cooking process in its tracks. 4. Without wasting any of the nice caramelisation in the pan (although you may want to add a little more oil), sauté the onion, garlic and ginger then add the pepper, depending on how crunchy you like it, and then the broccoli, bearing in mind that you want to get more heat and flavour into the broccoli than colour – you might want to turn the heat down and allow everything to soften and sweeten a bit – for 5-10 mins. 5. Mix the stock, sugar/honey and soy together in a bowl and add to the pan, cranking the heat back up to let everything reduce down. 6. Mix a couple of teaspoons of cornflour with enough water to cover it then add to the pan, stirring rapidly to let the mixture thicken the sauce. 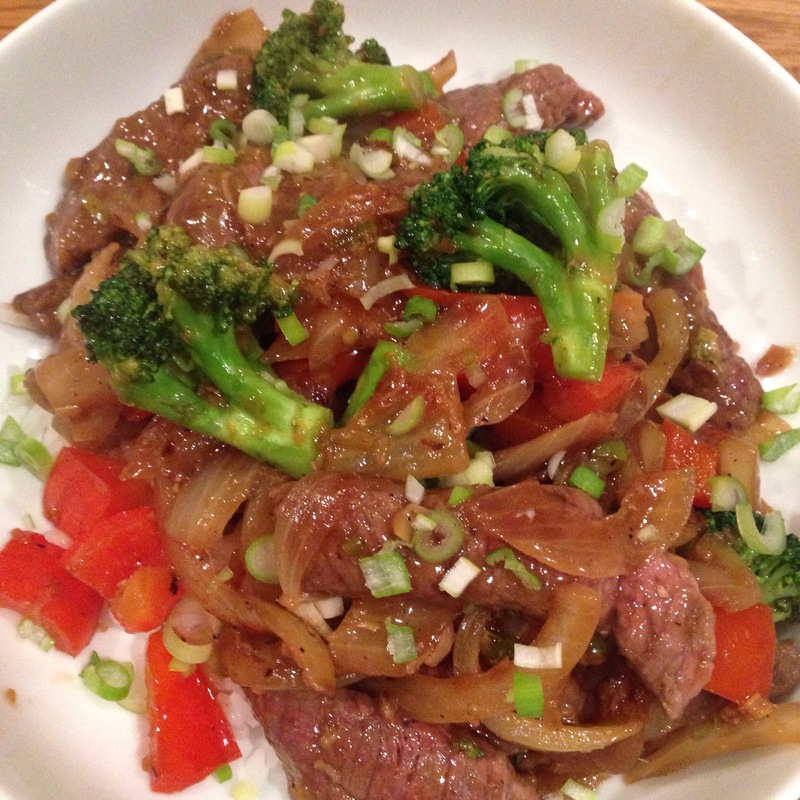 You’re aiming for a sauce that will coat the beef and veg – not a pool to drown your rice in. Add half of the chopped spring onions to wilt a little. 7. Once you’re happy with the consistency of the sauce, put the beef and its resting juices back in the pan for a minute or so, depending on how well done you like it – pink is best! Serve with jasmine rice, brown rice or noodles and sprinkle with the rest of the chopped spring onions.